L2P’s design studio relocation provides a new foundation for our growing firm and evolving culture. The environment supports a high-quality experience for our team and guests through specialized yet flexible spaces. L2P is an award-winning Philadelphia-based architecture and interiors design firm. As workplace design specialists, we approached our own relocation project as an opportunity to refine our process, test assumptions, and build a space for learning. Studio work is team work. We took the opportunity for full-floor expansion, reorganizing groups for efficiency and creating variety of settings to support our way of working, meeting and mentoring. The plan is loosely symmetrical on a horizontal axis, with design studios to the north and south bookended by generous gathering spots at reception and hub. Library, living room and support areas cut through and connect. Unlike our previous workplace, separate operations and business development zones provide focused confidentiality. Our gallery, pin-up, and open studio workspaces welcome guests to explore. Conferencing at the front and back of house provide variety in size, formality, privacy, technology and furniture. Our aesthetic is distinctly architectural. The use of a simple palette, subtle patterns, and natural materials allow the design to recede, so our client work stands out. Project development and materials storage is organized for flexibility in handling and display. 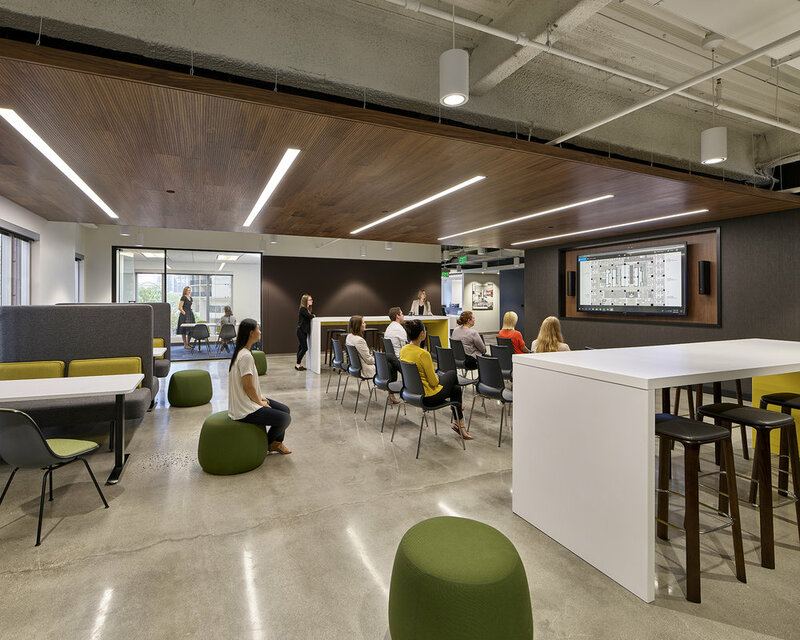 Comfortable seating, plenty of natural light, and a variety of tools help our teams connect with each other and our clients, design partners, vendors, associates, family and friends. The space is energetic and inspiring, a showcase of our experience in partnership and design.